Bodrum is a town on the southern Aegean coast of Turkey, popular with tourists from all over the world. Bodrum is the site of the ancient city of Halikarnassus, the location of the famous Mausoleum of Halikarnassus (built after 353 BCE) – one of the Seven Wonders of the Ancient World. Unfortunately, the ancient monument was destroyed by earthquakes in the Middle Ages – some of the remnants can be seen in London’s British Museum. Bodrum is a fascinating place as it has a pleasing contrast between the Ancient city – where there are discernable fragments everywhere in the town -and a playground for rich Turks and an array of foreign visitors. It is one of the centres of the Turkish Tourist industry and is the market town for the Bodrum Peninsula which consists of a number of towns and villages nestling on the edge of the Coast. Until the 1960’s the town was a fishing village which changed when a number of Turkish intellectuals gathered and wrote about Bodrum. Most notable of the these was Cevat Sekir ‘The Fisherman of Hallikarnassus’, an Oxford Educated Turk who devoted his time to writing and planting numerous plants and trees which continue to dot the landscape of the Town. His book the ‘Blue Voyage’ describing gullet trips around the Turkish coast, and his descriptions of the astoundingly clear Blue Seas of the Aegean and the delights of a trip around the coasts adjacent to Bodrum inspired a whole generation who have come to emulate his trips. 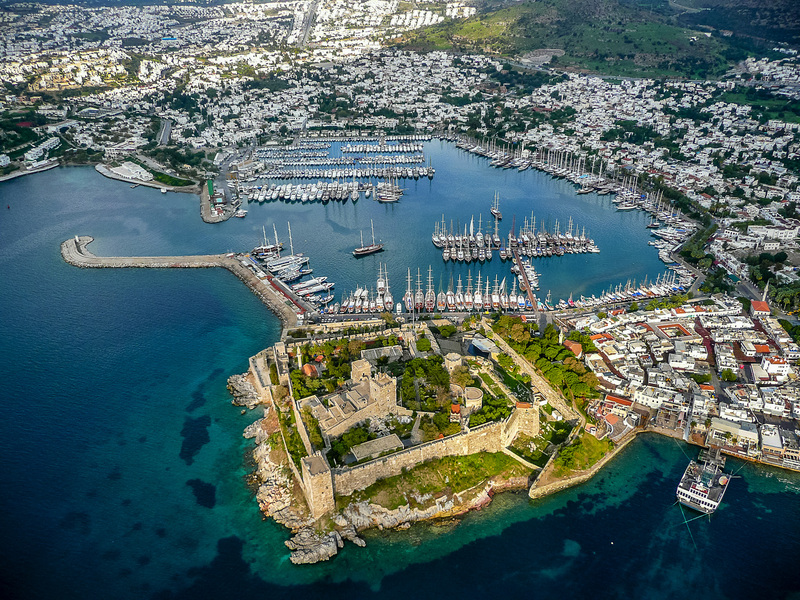 Bodrum has therefore grown as a sailing destination and thanks to its warm but not humid climate has become a top destination for visitors who enjoy the combination of the ancient past together with all the usual tourist paraphernalia. There are large numbers of shops and restaurants – from humble cafes to exquisite Turkish cuisine served by an array of waiting staff. Modern Bodrum strangely seems to have two contrasting sides to it. The east half of the town has a long thin but reasonable beach, which has been added in the last few years, with the authorities trying and largely succeeding in creating a good beach. Behind the beach lay all the bars, restaurants, and night clubs that are typical of Mediterranean resort towns. This means open fronted bars that do not come alive until 10PM when everybody goes out. As well as some nice beach fronted bars (e.g. cafe del mar being a reasonably chilled out and attractive bar, with attractive staff so that helps) it also has some terrible ones, if you do not like the hard drinking culture of some tourists. It does have some reasonable clubs. Halikarnas being the obvious one as it is huge (4000 people). It also is mostly outdoors and hosts foam parties on regular occasions. The other half of the town is the west side. This mainly revolves around the Marina and Yacht Club. Here life is a little more sedate with shops catering mainly to those who have stepped off their boats. Expensive supermarkets with proper wine and olive oil as well as the obligatory Helley Hanson to be able to purchase your new jacket. There are a number of nice restaurants if you look hard enough and some good clothes shops. Like all resorts being directly on the sea front increases the prices. During the evenings there is a wonderful atmosphere as the locals and tourists all seem to promenade along the sea front. There are many cultural events – notably the Ballet Festival in August, a wide range of pop concerts at the Castle or in the Amphitheatre which has been restored in the last few years, having been built some 2,000 years ago. Halikarnassus had its glorious days, when it was the capital of the Karia B.C. 353. 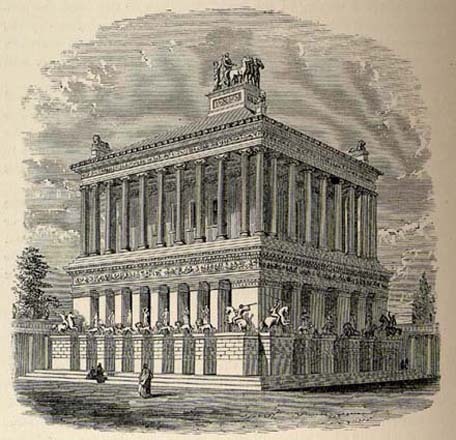 One of the Seven Wonders of the Ancient World, the Mausoleum, was built there by Artemisia for the memory of King Mausolos. After the Roman and Byzantium rule for ages, Ottomans have conqured the city in 1522, during the time of Suleyman, The Magnificent. The city was named “Bodrum” after the Turkish Republic was declared. Known as one of the Seven Wonders of The Ancient World, The Mauseloum was built by Artemisia, the sister and the wife of King Mausolos, B.C. 355. This work of art, stood on a 21 stepped pyramid which was 46 metres high and carried a horse car symbolising victory on it, had 36 marble columns in Ionian style. The mauseloum was destroyed in an earthquake; and the ruins were used in building of the Halikarnassus Castle. Many statues and reliefs from the mauseloum were carried to The British Museum by archeologist C. Newton, in 1856 and now lies there for public viewing. During winters and springs, November through April, the weather in Bodrum is generally very good with a few heavy shower periods, usually taking place in November, and then some time after new year and the last one in March/April. February is especially pleasant with not too cold nights and the almond blossoming and the abundance of wild ruccola all over the place. Summers, arriving after April, are as hot as it can get (expect temperatures higher than 40 C) and sunny with no rain. Bodrum-Milas airport is 35 km away from Bodrum and many flight companies operate charter flights to Bodrum in Summer season. There are also Dalaman and Izmir Airports which are 3 hours far away from Bodrum. There are many intercity bus companies which operate bus services to Bodrum from major cities of Turkey such as Istanbul, Ankara, Izmir, Antalya, Adana, Bursa, Konya, etc… After arriving at any of these cities, Bodrum is reached by bus. By bus: from Istanbul to Bodrum 13 hours; Izmir to Bodrum 4 hours; Ankara to Bodrum 10 hours, Antalya to Bodrum 7 hours. Sometimes, if you are arriving from a very distant destination (such as Cappadocia), the bus will not arrive directly to Bodrum (inquire about this when you purchase your ticket as they don’t always bother to let you know and some buses are direct while other are not) but rather arrive at a nearby town (usually Mugla) where you will change to a smaller bus which will take you directly to the central bus station in Bodrum. The original bus ticket you purchased to Bodrum will usually include this leg of the trip in the price so make sure you do not pay again when the ticket seller comes by to collect the ticket fee on the smaller bus. The best way to get around is by dolmuş, (a shared taxi following a fixed route) one of the cheapest ways of transport in Turkey. Bodrum Castle/Castle of St Peter (Bodrum Kalesi), Tu-Su. Built from 1402 by the Knights Hospitaller, the Castle is easily the most prominent landmark in the city. The castle now operates as a museum, with the focus on the Museum of Underwater Archaeology (see below). It is one of the world’s best preserved monuments dating back to medieval times. The supervision of the construction of the castle was assigned to the German architect Heinrich Schlegelholt, so that the latest developments in castle design were included. The castle is quite pretty and the views are spectacular. Myndos Gate – The old city gates, built under the reign of King Mausolus. It was the scene for one of the greatest bloodiest battles during the siege of the city by Alexander the Great. Karakaya Village – This 300 year old town is one of the oldest settlements in the Bodrum peninsula, situated close to Gumusluk. While half of the village is abandoned, owners of the other half restored their houses to its original look. The village has windmills from the 18th century. Bodrum Museum of Underwater Archaeology, inside Bodrum Castle, tel +90 252 316 25 16, fax +90 252 313 76 46, Tu-Su 9AM-12PM, 2PM-7PM, closed Mondays. established in 1961, this great museum has won numerous awards, and displays amazing finds from underwater excavations along the Turkish coast. Includes the famous Uluburun Shipwreck, one of the earliest and richest wrecks yet discovered. Not to be missed. During the peak season, the beach that stretches between the castle and Halikarnas is very good for swimming; The water is roped off to prevent boats coming in, and the beach and water is cleaned daily by the restaurants and by the city authorities. Sunbeds and beanbags on the beach are free of charge, although the restaurants that own them will bring you menus or offer you drinks every half hour. Another option is to go to the nearby beaches of Gumbet or Bitez: Grab a Taxi or go to the bus station and hop on a Dolmus. These beaches are much more suited for sunbathing and have actual sand (Bodrum’s beach is mostly pebbles, whereas the water at Gumbet & Bitez is very shallow), sunbeds are free of charge and loud music is also there to entertain you. There are several pools with bars that do not charge an entrance fee even if you are not ordering anything. A variety of water sports is offered. You can also hire a private boat for your own trip around the bay. Make sure all passengers have and wear lifejackets and that there is an emergency oar and kit on board. Taking a mobile phone in a plastic bag is advisable. Try snorkeling (go for good quality glass based goggles and kit available in most shops at around). Aquatica – If you are looking for crazy Day Parties and a unique summer experience then try out this Floating Beach Club. It is located on the sea, in an untouched secluded bay, between Bodrum and Gumbet (access by shuttle boats). This concept offers day parties with international djs, food, drinks, various watersports, and much more. It is open everyday (11am till 8pm) from mid june to mid september. Hamam — Bodrum has a fine hamam, also known as a Turkish Bath, located a few blocks inland from the harbour. Facilities are separated by gender with both sexes enjoying the same hours of operation. It is situated right across the bus terminal. Further afield there are the mud baths to visit. You go down the river on a rickety of chug-chug jump in bit baths of mud and roll around (The fun bit) and then clean off and go home. It’s also easy to go across to Kos or Rhodes for a day or two. When arriving there get a scooter (very dangerous but the best and easiest way to get around). There is of course loads of old architecture to visit around if you like that kind of thing. Windsurfing — There are some good possibilities for windsurfing at nearby Vass. It has a bit of a hippy air to it with lots of hire stands for boards and sails. Some may find there are just tooooo many people around in high season for it to be much fun, especially when there are competitions running. Pure Windsurfing Centre is another option in the peninsula. There is a great range of windsurfing boards and sails for rent. The bay is nice, quite and safe, so you don’t need to worry about an overcrowded location. The bay has cross shore conditions and you can be planning straight from the beach. Perfect for beginners in the mornings and in the afternoons for the more experienced windsurfer. Diving – There are many diving clubs doing daily scuba diving tours all around the region, fees usually include lunch and snacks prepared on boat. Boat Tours – Public boat tours are arranged from almost all the beaches. Alternatively, you can make early reservation with the tour operator of your choice, many tour operators are located in the Bodrum Marina. Boat tours are a good way to explore various beaches surrounding Bodrum, as well as some must see island strands you can’t reach by road. Yacht charter in the Aegean Sea. Take a dolmus from the central bus station(otogar) to the Tropical Camel Beach. It takes approx. 30min. from the bus station to the Camel Beach. The sea and the beach is one of the greatest in the Bodrum Peninsula. Tour in the marina and Bodrum Castle. Flaka Cruising, Bodrum, Bodrum is known for its old traditional wooden sailing boats, so called gulets. Mainly, there is sailed in the gulf of Gokova and Hirasonu, the Blue Cruise or Blue Voyage as the trip is referred to, is done by motor/engine however there are a few charter companies who sail by windpower, one of them is Flaka Cruising and does offer this service by sailing by wind. Gulets can be chartered for your family gathering or by cabin. In the last case you share the gulet with other guests form around the world. Follow us on social media to keep up-to-date with latest news, discounts and events.